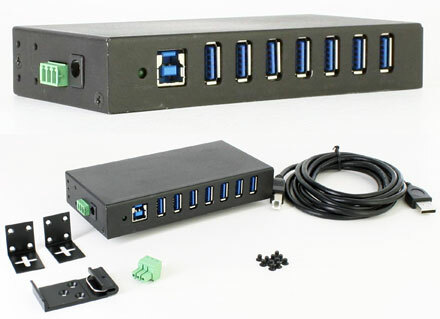 7-Port Industrial USB 3.0 Hub with 15KV ESD Protection adds 7 USB 3.0 ports to your system from a single USB port, enabling additional USB device connections. It delivers SuperSpeed USB data transfer rate up to 5Gb/s, offers built-in 15KV ESD protection with over-current detection and protection circuit design. This industrial USB hub also supports 600W power input surge protection on each port to safeguard your connected USB devices and the hub itself from unforeseen power surges, providing smooth and reliable data transferring performance. It is wall and DIN rail-mount supported for easy integration, and its industrial grade rugged metal housing enclosure design allows you to expand your USB capability in harsh industrial environment. Power input range is from 9-24VDC.